The cyber-mafia is stepping up pressure with a new, highly malicious ransomware strain that only takes one click to infect a workstation. 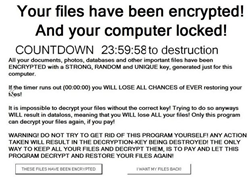 This aggressive ransomware gives the victim a mere 24 hours to pay the ransom in Bitcoin. It's called the "Pacman" ransomware, suggesting pictures of something eating up all files. This attack has been rated high-risk because of its highly targeted nature and the degree of social engineering used. This new ransomware strain is highly malicious. In addition to its ransomware payload, the code includes a keylogger and has "kill process" capabilities that shut down Windows operating system functions like taskmgr, cmd, regedit and more which makes it very hard to remove this malware. Initially reported by CSIS, the email, using perfect Danish, is disguised as a "possible new patient", just moving into the area, with bad neck and back problems, and looking for a new therapist. The new patient conveniently has links to his MRI and CT scan, because his back is a case of its own. The malicious code has been developed in .NET, so it needs to have the .NET package installed, which most Windows machines have installed by default these days. From there, "pacman.exe" is extracted and dropped on to the system while initializing the encryption of files on the local hard disk. The code searches the disk for data files which are subsequently encrypted. After a system has been compromised it will call home to the central Command & Control server. A new file extension ".ENCRYPTED" is added to all files and the process replaces the desktop of the infected machine with instructions on how to regain access to the data. “1) If you have not done so already, on your "edge" device whether this is a web-filter, proxy server or firewall, include Dropbox as a blocked domain. This may not be popular but it's a corporate survival point. It's also a way to get back some control over "shadow-IT".